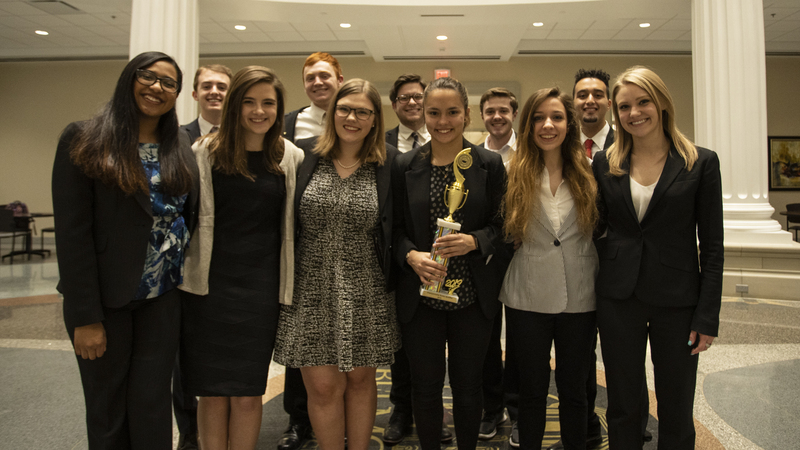 Belmont University’s Undergraduate Mock Trial Team scored fourth best of 20 teams at the 2019 American Mock Trial Association (AMTA) Regional Competition in Louisville, Kentucky held earlier this month. In its third year of competition, Belmont’s team earned a bid to the Opening Round Championship Series Tournament (ORCS) in Memphis, Tennessee. In Memphis, students will compete for a bid to the 35th AMTA National Championship Tournament in Philadelphia, Pennsylvania. In addition to the team’s victory, Elizabeth Sutphin, freshman global leadership studies major, was named one of 13 outstanding attorneys and Kevin Botros, sophomore political science and philosophy major, was named one of 15 outstanding witnesses. The student-led Mock Trial team is a part of Belmont Undergradute Pre-Law Society, and its interdisciplinary team members hail from four colleges. Representatives include College of Health Sciences student Elia Despradel (social work); Curb College of Entertainment and Music Business student Kaleb Gille; College of Liberal Arts and Social Sciences students Kevin Botros (philosophy and political science double major/honors program), Gordon Carroll (politics and public law), Aubrey Keller (english and honors program), Hunter Lindsey (politics and public law), Sarah Anne Pfitzer (english), Luke Worsham (communication studies and honors program); Interdisciplinary Studies and Global Education students Carmen Mendez (legal studies), Elizabeth Sutphin (global leadership studies).